In the United States, homes use 110 -220 volt AC (alternating current) electrical systems. AC electricity powers everything from a household lamp to furnaces and air conditioning units. Direct current (DC) electrical current powers disposable and rechargeable batteries, such as car batteries, flashlights, iPods and cellphones. In order to use low voltage, 12 V DC systems in a home, the AC current converts to DC, or an alternative power supply system is wired into the home. Consumers often install 12-volt accent lighting under kitchen cabinets to shine directly on the countertop. Inside the home, low-voltage 12V accent lights add a unique look to furniture and cabinetry. Homeowners use low-voltage 12V interior lighting often inside of glass-front cabinetry. The low-voltage lights highlight the cabinet and its contents without creating unwanted heat buildup. Low-voltage light also decorate kitchens. Low-voltage halogen lights installed under wall cabinets give direct lighting onto the kitchen countertops. 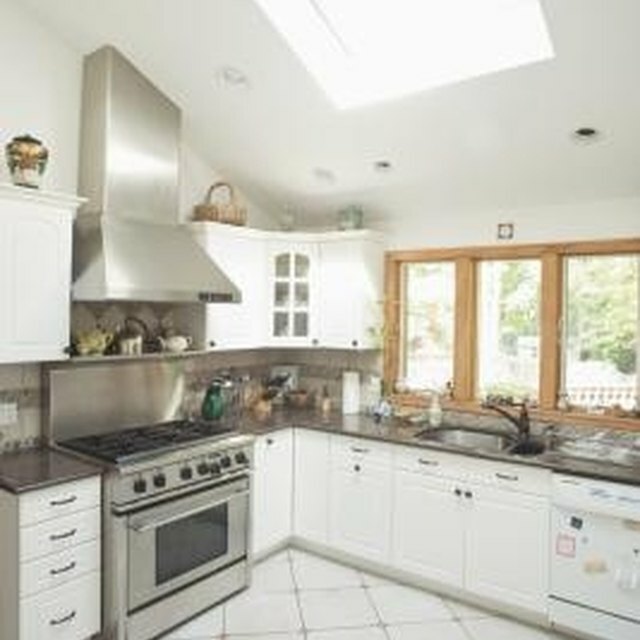 The same lights often appear above upper cabinets in a kitchen built without a soffit. The lights accent the kitchen decor, and add beauty and uniqueness to the room. These lighting systems get power from an AC-DC voltage transformer, which converts the available AC power to DC. One of the advantages of 12\V low-voltage systems is the increased level of safety when dealing with exterior lighting. If a 110V circuit encounters moisture, the high current levels will cause an overload, and the resulting short can cause a fire. High voltage 110V lighting also creates large amounts of heat, which are disadvantageous in some outdoor settings. Some ground plants suffer harm from localized high temperatures created by outdoor spot lamps. Low-voltage 12 V systems offer attractive exterior accent lighting around a home. “Mushroom” style lamps that line driveways or walkways create an inviting accent as well. Low-voltage LED spotlights to increase the warmth of a home's exterior. As home owners look for ways to decrease their dependance on traditionally generated power, 12 V lighting systems provide an alternative to 110V lighting. With the advances in LED and florescent lighting, 12V systems can illuminate entire rooms instead of just providing accent lighting. By integrating a second electrical supply grid into a home to selected areas, homeowners can power lights with 12V DC power, and reduce their demand on the traditional power pipeline. If homeowners wants to move beyond traditional 110V AC power systems, many alternative energy sources are available to generate DC power. A small wind-powered generator creates enough 12 V DC current to charge a small battery bank. When homeowners integrate these power systems, they see the results in reduced energy costs. Solar panels also create 12 V power. By integrating a battery power source into a home electrical system, home owners can make the transition to relying on more renewable power sources.